Over 320 days of sunshine a year! This statistic is based on a 10 year study in Sobrabre, the district where we live. Below is our current local weather forecast. Click on this widget for a full weekly forecast. We find El Tiempo to be the most accurate! 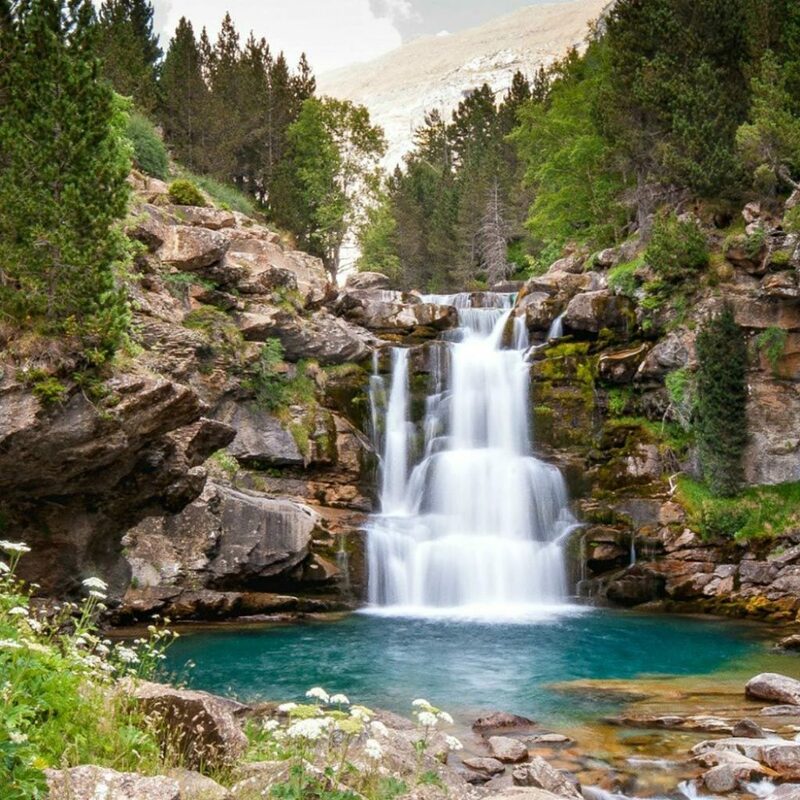 Our central location in the Spanish Pyrenees means we benefit from the perfect balance between the hot Mediterranean and cooler Atlantic climate. It is here that we have our Self Catering Cottage and Guest House, the base for our Small Group Activity Holidays. It is important to remember that at any time of year, across the entire mountain range, a rise in elevation of 200m can mean a fall in temperature of around 1°C – even in summer! Spring is one of our favourite seasons, it seems to arrive suddenly and quickly feels like summer. The average daytime temperatures are between 15°C and 25°C. The valleys display every shade of green imaginable. By midday it is often shorts weather, although venturing high means a good layering system of clothing is needed. We start to eat outside on the terrace often with a parasol for shade. Even in springtime there can be snow flurries, however it never lasts. As June arrives, the flowers and butterflies are amazing. The snow begins to melt on the mountain tops and the rivers turn aquamarine. Summer tends to be hot with intense sunshine. During the day, temperatures normally reach between 26°C and 32°C, but the night air is pleasantly cool. In July and August thunder storms can develop late in the afternoon or in the evening. These make for dramatic skies but pass quickly and within a few hours we have clear skies again. Be aware that the sun is extremely strong, exposed skin is not a good idea. 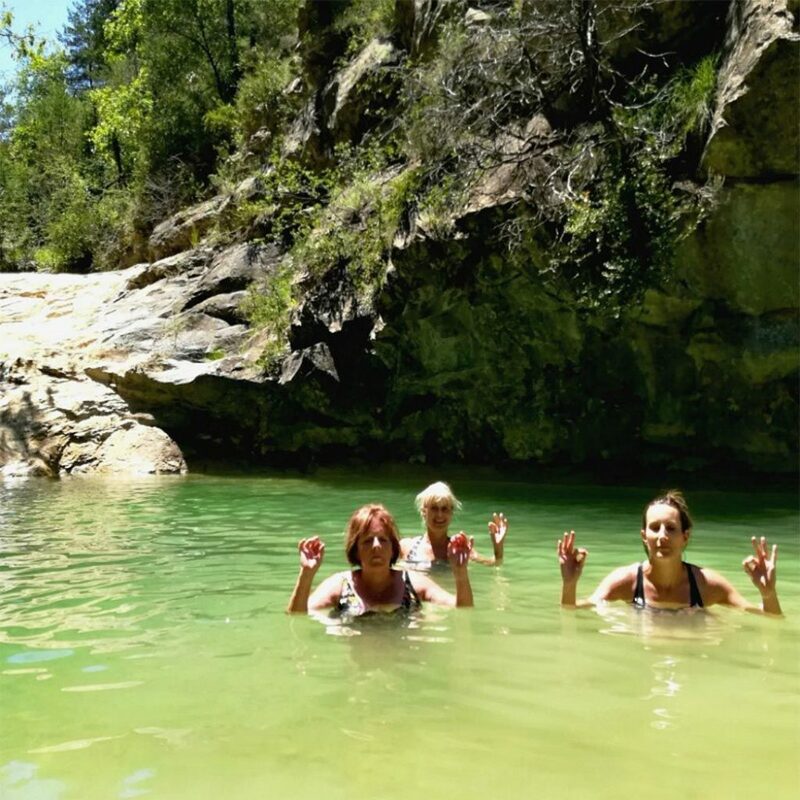 It is cooler higher up in the mountains, and a great time to go down to the river, or visit one of the nearby natural pools for a swim, we have some favourite spots! Our favourite season, we often enjoy the warmth of an Indian summer, with blue skies and mountain colours. 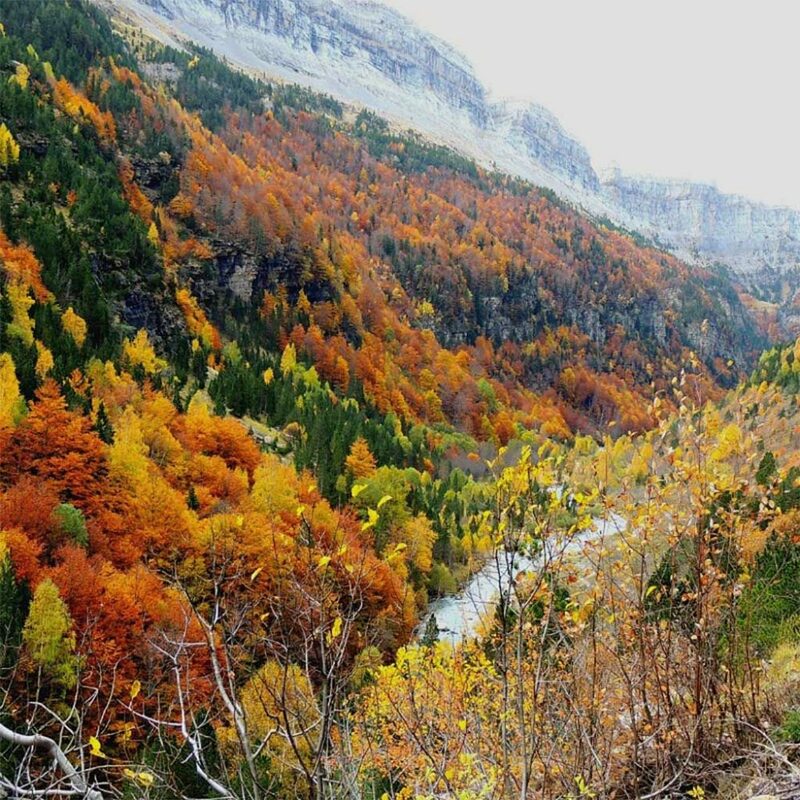 The weather in the mountains can be unpredictable, Autumn brings the possibility of rain. It can be cool first thing but by midday the shorts are back! Maximum daytime temperatures range between 15°C and 25°C. Evenings cool off quickly as the days get shorter. We are still eating lunch outside on the terrace (work permitting, coffee and tea as well!). The mountains are a blaze of red, ochre and every shade of brown imaginable. It is a good time to go and pick mushrooms, a favourite past time in the valley. Daily temperatures are more variable with cold starts. We do however get plenty of winter sunshine, a world away from the grey UK winters we both grew up with. By midday it´s warm enough to peel the layers off. January is the coldest month, heavy frosts and night time temperatures as low as -10°C, but beautiful clear blue skies during the day. 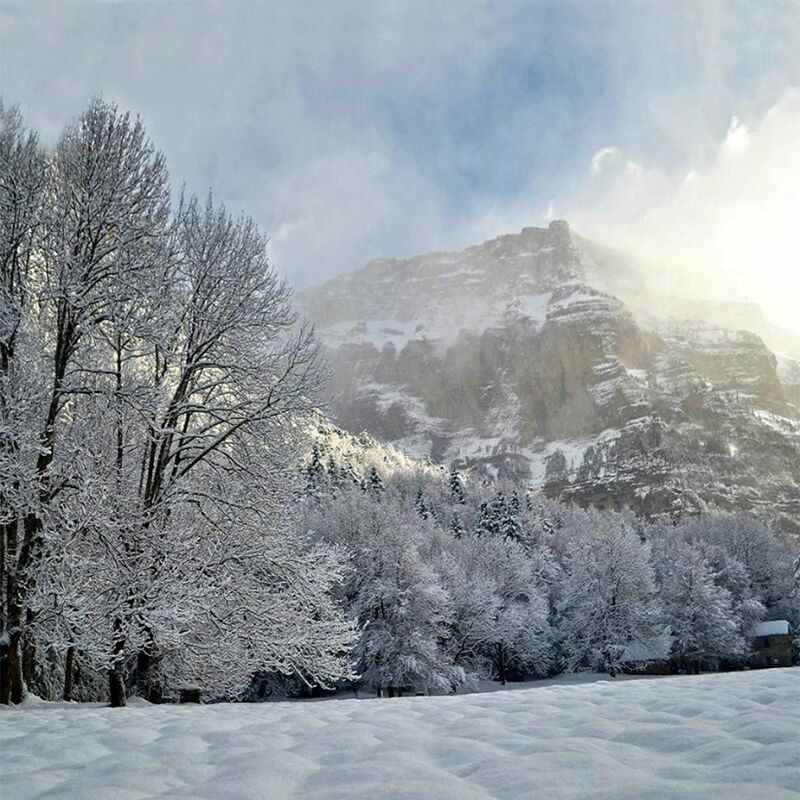 At our self-catering cottage in Torla, you can often find snow on the ground from December through to February. The perfect place for a romantic Christmas escape, with a cosy cottage and a log fire to return to. It is a good time to head to the National Park of Ordesa, where the snowshoe walking is spectacular. Aragon Active, Calle San Urbez, 22371, Albella, Huesca, Spain. Contact us with any questions or queries and we'll get back to you as soon as possible! I consent to Aragon Active collecting my details through this form.